The Mountain Lilly, abandoned in the French Broad River, circa 1880-1885, near Hendersonville. Image from UNC-Asheville. 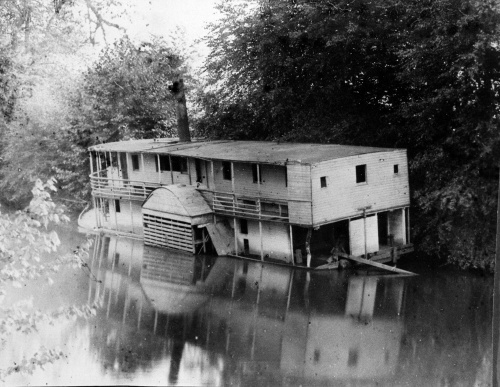 On February 3, 1881, entrepreneurs chartered the French Broad Steamboat Company, with the objective of ferrying passengers and freight along the river from Asheville to Horse Shoe to Brevard. Six months later, they christened the frame, 90-foot-long, two-deck excursion boat the Mountain Lily. Like its eastern North Carolina counterpart, the CSS Neuse, the Mountain Lily met its fate not far from where it was constructed after a few years. Many at the time and since have regarded the venture as folly. The French Broad is a low-volume river that can barely float low draft vessels in any season. In the years before the launch, federal funds had permitted the removal of debris and stumps, which helped make the project more viable. On August 2, a champagne bottle was broken on the prow of the steamboat, gleaming white with green trim and sporting two staterooms each with a capacity of 100. Supporting the vessel were two 12-horsepower motors. The crowd and brass band enjoyed a barbecue. The captain rang the ship’s bell in celebration. The dream was to be short-lived. Four years later the ship ran aground and was abandoned. Salvagers used the lumber to construct Riverside Baptist Church in Horse Shoe where they installed the bell. The two engines were re-purposed to serve local sawmills. Visit: The N.C. Maritime Museums in Beaufort, Hatteras and Southport, and the N.C. Transportation Museum in Spencer all tell the story of water-based transportation across North Carolina.